Install a convenient sink and work area in your business with the Regency three compartment stainless steel commercial sink! This compartment sink is made of 16-gauge type 304 stainless steel for long-lasting durability and exceptional resistance to corrosion to guarantee longevity. Each sink bowl measures 16" x 20" with a 12" depth to hold water, sanitizer, dishes, and more, while (3) 3 1/2" basket strainers prevent scraps of food from clogging your plumbing. For sanitation, the coved corners of the sink bowls allow for fast and easy cleaning. This 3 compartment sink is great for my food truck. It fits the full size hotel pans perfectly. The drainboards are made so the water slides off completely. The best thing about this sink is that it's well made and will last a very long time with the proper care. I am very happy with this sink! This sink is the perfect size to handle all the pots, dishes, and sheet trays. it has good sink depth making cleaning pots very easy. Great sink! Very durable and easy to clean. In the future I hope that put some mounting holes along the top to make attaching to the wall easier. I would also recommend buying the leg braces because overtime they start to bow out. It is always something you can buy later if it happens to you. We searched businesses in the surrounding area and also searched the internet for a quality 3-compartment sink. The price at Webstaurant was so much lower that we were afraid that the sink would be inferior or would arrive damaged. However, the sink arrived in a timely manner, in perfect condition and is great quality. We are very pleased. This is a great sink. I use it in a bakery and it allows me to wash everything I need, including the bowl for an 80 quart mixer. Set up was simple and the bowls are really deep. Very satisfied by this product. Easy to install, easy to clean. Good for food inspection. The sink is deep enough also to let my stuff inside to clean everything is the same time.. This three bay sink is of good quality and the price was good too. It is so essential for us to clean our dishes properly and to sanitize them. This three compartment sink is great for our kitchen. It was easy to put together and install. It came at a great price for such a sturdy piece of equipment. A very good, sturdy and durable three compartment sink. The drain board is pitched to allow for perfect air drying. Stands up well to kitchen abuse. Be sure and order the correct faucet! I love the spaciousness of the sink compartments in this unit. You can fit plenty of dishes in each sink and have room to scrub them. This triple sink is made with quality materials. The sinks are the perfect size for all of our washing needs. I would highly recommend for any size kitchen. I purchased this sink to use in a garage/kitchen conversion. The size of the bowls are what ultimately made me decide on this particular sink. I searched for a sink with a deck mount faucet, both here at Webstaurant and other places, with no real luck. I was able to find underbar sinks, but the bowls were only 10"x10"x10." Not a chance of those dimensions working for me, so I purchased this one and am very pleased with it. We are so very pleased with this sink. It's a good quality at a great price. The basins are large enough to accommodate a full size sheet pan. It makes cleanup a breeze. You will not find a better quality sink for the money. Nice deep bowls and a lot of storage room underneath. We have a limited space and this was the biggest sink we could fit and it has been doing the job great. Very good quality 3 compartment sink. Very sturdy, and is very easy to assemble. And it is the best price you will find online anywhere. This three compartment sink is a good addition to any dish room, as long as there is a sink with larger basins available. Regular items like cutting boards can't be fully submerged in sanitizer, but that is the only disadvantage to this setup. Very sturdy sink! Great price for a kitchen necessity! We have several regency products and they are all great.. Love the wide space between compartments! Our plumber commented on what a high quality sink this was. He works with lots of restaurants, and he said it felt much more solid than many of the sinks he has worked with. What I love about this piece is its dimensions are true, I was literally putting this on a 88" wall and was a bit skeptical but it came through! This sink is great for small bakery. The depth of the bowls are fantastic and the width is large enough for us to easily wash our cake pans. This is an incredibly sturdy sink for the price. We use it to wash out mugs and other coffee shop equipment, and it always has plenty of space to keep dishes moving. THE REGENCY GRAND IS. BUT I NEED TO TELL YOU ALL WHO READ THIS ABOUT HOW INCREDIBLE THESE PEOPLE ARE TO WORK WITH, AND HOW THERE SHIPPING IS THE BEST YOU WILL GET. I WAS VERY NERVOUS ABOUT HAVING THIS EQUIPMENT SHIPPED FROM A TRUCKING SERVICE BUT THEY WRAPPED EVERYTHING, THEN STRAPPED IT TO A PALLET, THEN BUILT A WOOD BOX AROUND IT, THEN WRAPPED IT AGAIN. WOW. THESE GUYS ARE THE REAL. This sink was a perfect size for our location. 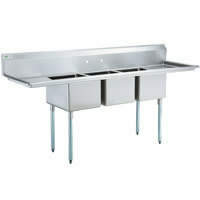 The double drainboards are convenient for loading and drying according to most health department standards. It's pretty heavy duty for the price. My kitchen is full of Regency products. From the sinks that I have to the wire rack shelving, everything has blown me away at the quality that they deliver. This sink is great. Very sturdy sink! Great price for a kitchen necessity! We used small plastic clips to secure it better against the wall. Love the wide space between compartments! Sturdy, amazing price andgreat product. Can't go wrong with this three compartment sink-so glad I found this and purchased for our restaurant. Couldn't have gotten a better deal. This three bin sin is phenomenal! perfect for our small cupcake shop kitchen. Very sleek looking and fast delivery. easy to install and perfectly wrapped and undamaged. I purchased this 3 bay sink along with a few other regency items, and every one of them have been good. They are the "budget" models, but unless you are beating them up every day, you shouldn't have to worry about them at all. Definitely worth every penny. This is just the perfect sink! Not too big but enough for our restaurant needs. We bought it before opening and had no problems at all with the health department's inspection. Love the fact that it has two drainboards. Another good buy from Regency, but again, the strainer baskets and plumbing fittings are very light duty. I'm interested in seeing how it holds up in a busy kitchen. Sink is well built and sturdy. Good price but first one came with the leg broken off and second one came with a warped drainboard. I realize it's an economy level product but was a hassle to have to get a plumber to come twice. Webstaurant customer service was very cooperative, though, and gave me a discount due to the damage. This sink is a great value. I have bought 2 in the past 3 years. You can choose to spend lots more. But it is a dish sink. It serves its great purpose. This sink is great! The depth of the bowls are fantastic and the width is large enough for us to easily wash our dough boxes. This is a very large sink that makes hand washing dishes very easy!! Nice drainboards on both sides of the sink!! Easy to install! Strong and sturdy!! I think the sink should be a little taller, i am short and i have to bend down so far to wash the dishes, i can just imagine the pain of someone taller. This 3 bay sink has plenty of space. It has nice deep compartments and is nice and sturdy. It's not too heavy but it is sturdy. I have been more than satified with this sink it holds water and is not rusting. I will buy another one in the neer future. Excellent steel construction for the price paid. The only issue that needs improvement is the legs. They are not as rigid as they're supposed to be. But other than that, the Sink is a good value and worth buying. This sink was great, we had trouble finding a sink that would fit our space and this is the only place that had a sink of this size. Worked great for us and is constructed well and easy to install.